Thanksgiving and Christmas are just two days out of the year. Just two days. However, the days before and after these two days, and the events surrounding them, are more than that. They can become an entire season meaning a whole lot of stress for your loved one. Yes, the holidays are coming, as you can tell by all the Christmas decorations that have been up in stores since before Halloween! So you are probably already feeling some nervousness or pre-holiday jitters concerning your loved one with bipolar disorder. In addition to the regular ways that you show support for your loved one, you may have to "step up" your efforts during the stressful holiday season. There are many practical ways to support your loved one. When your loved one with bipolar disorder is stressed, their body will produce more of the "fight or flight" responses than normal. This will affect the chemicals called adrenaline and noradrenaline, which help the body to fight what it sees as an emergency. Their blood pressure and heart rate will increase, and even stomach activity will be affected (commonly called "butterflies"). All of this stress can affect your loved one's mood swings. Christmas is that time of the year that can be very exciting. Maybe too exciting, especially for those suffering from bipolar disorder. It can be too easy to fall prey to a manic episode if you're not careful. Whatever your religious affiliation, December is the time to celebrate your holidays. 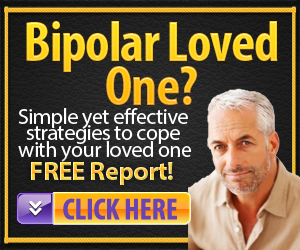 However, it is also a time that brings you more responsibility for your loved one with bipolar disorder, so that they don't go into an episode. Does Santa Claus Have Bipolar Disorder? Here it is Christmas, and I was wondering, do you think Santa Claus has bipolar disorder? What's the difference between sadness and depression when you have bipolar disorder? I was thinking about this question the other day. I came to the conclusion that there is a difference, and that one is an emotion, and the other can lead to a bipolar episode. I also came to the conclusion that you need to know the difference. December is full of holidays, and whether it’s religious, civic or patriotic, nearly everyone has a holiday in December. While these holidays bring joy to many people, they also make December a time that brings more responsibility – particularly when it comes to your loved one with bipolar disorder, especially so that they don't go into acting out behavior. During the holidays, stress can pile up on anyone. For those people who have Bipolar Disorder, this can actually lead to an episode of mania or depression. Sometimes, you may find that you need to just say no.